Beak and feather disease virus (BFDV) the causal agent of Beak and feather disease (BFD) is a small virus (14-16nm in diameter) with spherical symmetry and is referred to as a circovirus. BFD is one of the most commonly recognised viral diseases of wild psittacine birds worldwide and is characterised by chronic, progressive, symmetrical feather dystrophy and occasional beak deformity. BFDV is described by Rahaus and Wolff (2003) as a small (14-16nm in diameter) non-enveloped virus with isometric or spherical symmetry. It is classified as a Circovirus. \nTodd (2000) describes circoviruses as “small, non-enveloped, icosahedral viruses that are unique among animal viruses in having circular, single-stranded DNA genomes. The genomes being the smallest possessed by animal viruses.\"
Rahaus and Wolff (2003) describes the clinical symptoms shown by birds infected with this virus. The authors state that birds infected are, \"Characterised by a chronic, progressive, symmetrical feather dystrophy and occasional beak deformity. Typically, the first sign of BFD is a replacement of normal down and contour feathers with dystrophic feathers that stop growing shortly after emerging from the follicle. If beak lesions develop, they may include palatine necrosis, progressive elongation, and transverse or longitudinal fractures.\"
Todd (2000) states that, “birds usually die as a result of secondary infections, which supports the view that they are immunosuppressed (a condition characterised by a decrease in the body’s natural ability to fight infections and other foreign substances ). The author observes that this condition is consistent with the detection of bursal and thymic lesions. Todd (2000) further observes that clinical symptoms vary from species to species and also depends on the age of the bird. The most chronic form of the infection occurs in birds which are up to three years of age, although percute and acute forms of the infection have been reported in neonatal and very young birds. The Commonwealth of Australia (2004) reports that, \"All members of the parrot family are susceptible to BFDV. However, susceptibility to infection varies with age and species, and between individuals of the same species. Susceptibility will also be influenced by environmental factors, such as climate, nutrition, habitat quality and social factors\". Raidal et al. (1993) reported successful use of hemagglutination inhibition assays to detect the presence of BFDV in sera from wild sulphur crested cockatoos (Cacatua galerita), galahs (Eolophus roseicapillus), short-billed corellas (Cacatua sanguinea), eastern long-billed corellas (Cacatua tenuirostris) and other psittacine birds in New South Wales. Ypelarr et al. (1999) report that, \"A universal PCR assay was designed that consistently detected BFDV in psittacine birds from different geographic regions across Australia.\"
Raidal (2004) reports that, \"Spontaneous recovery from acute BFDV can occur in many species, including budgerigars, lorikeets and lovebirds. Some acutely affected birds also recover. However, the majority of chronically affected birds do not recover from the disease.\"
The Commonwealth of Australia (2004) reports that, \"Natural infection most likely occurs following ingestion or inhalation of BFDV in the nest hollow from infected faeces or feather dust from the parents. The virus is excreted in the faeces of diseased birds (Wylie and Pass, 1987; Ritchie et al. 1991; Raidal et al. 1993b). 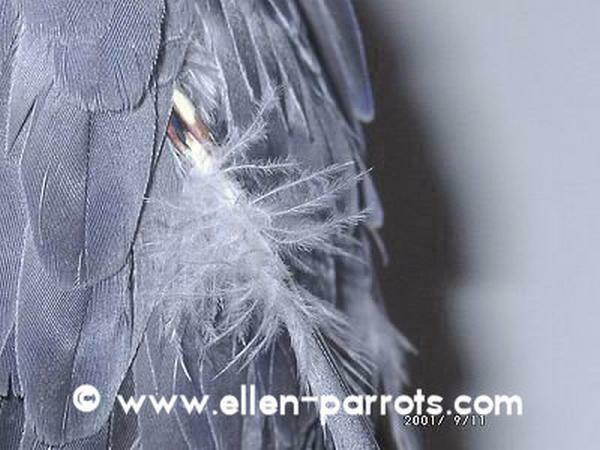 Feather dust may contain as many as one trillion virus particles per millilitre (Ritchie, 1995). Virus particles can also be recovered from crop washings from infected birds (Ritchie et al. 1991). Inhalation and ingestion of BFDV can also potentially occur at feeding, roosting and watering points in flocking birds.\"
Todd (2000) reports that, \"BFDV has been experimentally reproduced in a number of psittacine species including Budgerigars, Galahs, Umbrella Cockatoos and African grey parrots by inoculation of homogenates of feather material or purified virus preparations (Gerlach, 1994).\"
Rahaus and Wolff (2003) indicate that although BFD is known to infect birds from the order Psittaciformes, non-psittacine birds such as those belonging to the genus Gracula have tested positive for the presence of BFDV DNA using PCR. Todd (2004) reports that, \"Although the presence of large amounts of BFDV in affected feather material, faeces and crop washings make it likely that most infections result from oral transmission, there has been some evidence suggesting that vertical (egg) transmission also occurs.\"
The Commonwealth of Australia (2004) reports that, \"BFDV can be detected in the blood by DNA probe as soon as two days after natural exposure. The minimum incubation period for the appearance of dystrophic feathers in experimental infections is 21-25 days (Ritchie, 1995). 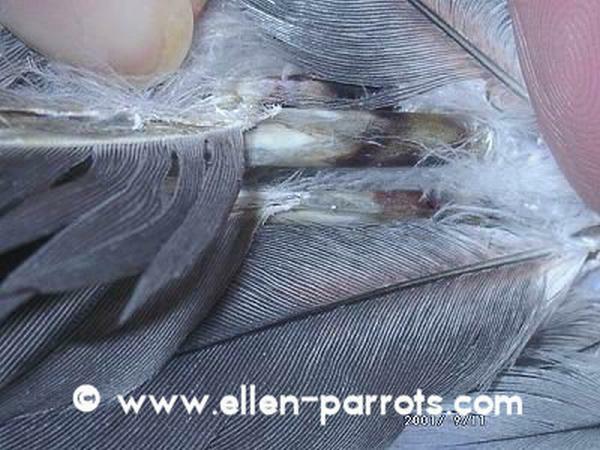 Birds that become infected after feather development has finished may not develop obvious clinical signs until their next molt six or more months later. The maximum incubation period can be years (Ritchie, 1995). Clarification of the range of the incubation period is desirable to make decisions on length of quarantine.\" The authors also state that, \"Experimental transmission has been achieved through oral, intra-cloacal, subcutaneous, intraocular and intranasal routes (Ritchie et al. 1992; Wylie and Pass, 1987). Vertical transmission (from parents to young prior to birth) has been reported on only one occasion with artificially incubated chicks from an infected hen developing disease (Ritchie, 1995).\"
The genetic diversity of the global virus population, compounded by the difficulties in effectively curbing illegal trade in wild-caught birds, has serious implications for the control of BFDV in southern Africa (Heath et al. 2004). Principal source: Todd, 2000. Circoviruses: Immunosuppressive threats to avian species: A review. Raidal, 2004. Psittacine beak and feather disease. Recommended citation: Global Invasive Species Database (2019) Species profile: Beak and feather disease virus (BFDV). Downloaded from http://www.iucngisd.org/gisd/species.php?sc=839 on 20-04-2019. 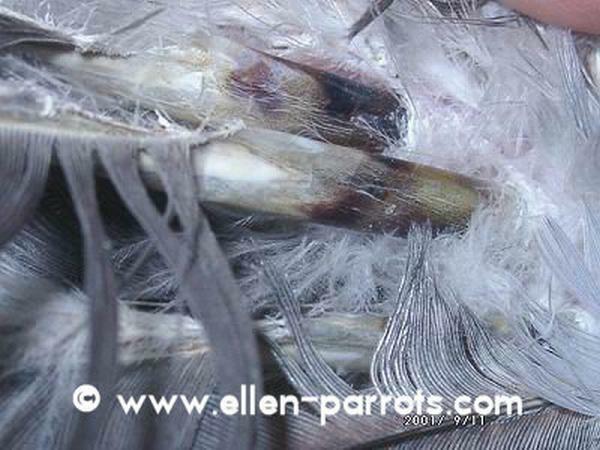 Clinical signs of this disease are characterised by feather loss and replacement of this lost plumage by deformed feathers. Baldness can also occur when the feather follicles become inactive. Deformities of the beak and claws can also occur. Birds infected by the virus can live for many years though the condition lasts for several months to a year. The birds usually succumb to secondary infections from secondary bacterial, chlamydial or fungal pathogens. .\"
Raidal (2004) reports that, \"Secondary disease problems commonly exist in association with BFDV. These include bacterial, fungal and viral infections. Most birds with chronic disease eventually have difficulty eating, lose weight and die. Acutely affected birds often have mucoid or green diarrhoea. These signs are often clinically diagnosed as secondary bacterial or chlamydial infections. However, the virus can cause acute hepatitis, particularly in cockatoos. Some birds may die of acute hepatitis without obvious feather lesions.\"
Todd (2000) reports that experimentation on BFDV, \"Has revealed that its ability to agglutinate erythrocytes was unaffected by incubation at 80°C for 30 min (Raidal & Cross, 1994a), suggesting that this virus is also very stable. It is likely that circoviruses are extremely resistant to environmental degradation, which, in turn, has implications for virus epidemiology and disease control.\"
Heath et al. (2004) states that, \"With the constant movement of birds across geographical borders through trade, there is an increasing risk of spreading the disease into new areas and populations. Coupled to this is the risk of generating unique viruses through recombination between established virus populations and newly introduced viruses.\"
Preventative measures: A killed-virus vaccine has been developed which stimulates immunity to the BFDV in normal healthy birds. Pet birds can be vaccinated when they are as young as 14 days old. There is a requirement of a booster dose a month after the first vaccination. Breeding birds can be vaccinated a month before breeding. After this pet birds should be examined every six months until they are 3 years of age (Raidal, 2004). Rahaus and Wolff (2003) suggest that, \"In order to stem the spread of BFDV inside captive bird populations, an improved combination of monitoring and quarantine seems to be necessary... Additionally, this monitoring could help in detecting birds in the viral incubation phase.\" Todd (2000) states that, \"Captive birds can be kept free from infection by restricting their exposure to infected birds or virus-contaminated environments such as cages.\"
The Commonwealth of Australia (2004) states that, \"BFDV is difficult to inactivate and is likely to persist in the environment for years, so the underpinnings of control in threatened species are effective diagnosis, monitoring, quarantine and vaccination. Disinfection of nest boxes when disease already exists is another important aspect of control, at least until a suitable vaccine is available. Identifying and managing the environmental factors that predispose to the development of disease may also assist in controlling the threat of this disease. Quarantine periods exceeding six months may be required, with diagnostic tests being carried out at 90 day intervals.\"
Informations on Beak and feather disease virus (BFDV) has been recorded for the following locations. Click on the name for additional informations. Bert, E., Tomassone, L., Peccati, C., Navarrete, M. G. & Sola, S.C., 2005. Detection of beak and feather disease virus (BFDV) and avian polyomavirus (APV) DNA in Psittacine Birds in Italy. J Vet Med B 52, 64�68. Commonwealth of Australia. 2004. Draft Threat Abatement Plan for Psittacine Circoviral (Beak and Feather) Disease Affecting Endangered Psittacine Species. Department of the Environment and Heritage. Dahlhausen, B. & Radabaugh, S., 1993. Update on Psittacine beak and feather disease and avian poloymavirus testing. Proceeding of association of avian veterinarians. Nashvile, TN, pp 5-7. Orange-bellied Parrot Recovery Team, 1998. Orange-bellied Parrot Recovery Plan 1998-2002. Parks and Wildlife Service, Hobart. Raidal, S. 2004. 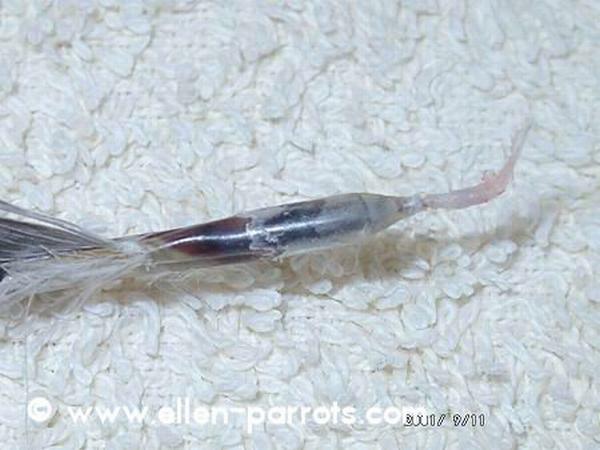 PBFD (Psittacine Beak and Feather Disease) online source. Raidal, S. R. & Cross, G. M., 1994. Control by vaccination of psittacine beak and feather disease in a mixed flock of Agapornis species. Aust Vet Pract 24, 178�180. Raidal, S.R., Firth G.A. and Cross G.M. 1993a. Vaccination and challenge studies with psittacine beak and feather disease virus. Australian Veterinary Journal 70: 437-441. Raidal, S.R., McElnea C.L. and Cross G.M. 1993b. Seroprevalence of psittacine beak and feather disease in wild psittacine birds in New South Wales. Australian Veterinary Journal 70: 137-139. Raidal, S.R., Sabine M. and Cross G.M. 1993c. Laboratory diagnosis of psittacine beak and feather disease by haemagglutination and haemagglutination inhibition. Australian Veterinary Journal 70: 133-137. Raidal, S. R., Sabine, M. & Cross, G. M., 1993. Laboratory diagnosis of psittacine beak and feather disease by haemagglutination and haemagglutination inhibition. Aust Vet J 70, 133-137. Riddoch, P. A., Raidal, S. R. & Cross, G. M., 1996. Psittacine circovirus antibody detection and an update on the methods for diagnosis of psittacine beak and feather disease. Aust Vet Pract 26, 134. Ritchie, B. W., Niagro, F. D., Latimer, K. S. Steffens, W. l., Pesti, D. & Lukert, P. D., 1991a. Haemagglutination by psittacine beak and feather disease virus and use of hemagglutination inhibition for detection of antibodies against the virus. Am J Vet Res 52, 1810-1815. Ritchie P. A., Anderson, I. L. & Lambert, D. M., 2003. Evidence for specificity of psittacine beak and feather disease viruses among avian hosts. Virol 1, 109-115. Sanada, N. & Sanada, Y., 2000. The sensitivities of various erythrocytes in a haemagglutination assay for the detection of psittacine beak and feather disease virus. J Vet Med 47, 441-443. Todd, D. 2000. Circoviruses: Immunosuppressive threats to avian species: A review. Avian-Pathology. 2000; 29(5): 373-394. Ypelaar, I., M. R. Bassami, G. E. Wilcox, and S. R. Raidal. 1999. A universal polymerase chain reaction for the detection of psittacine beak and feather disease virus. Veterinary-Microbiology. 1999; 68(1-2): 141-148. Baker, J. R. 1997. Survey of feather diseases of exhibition budgerigars in the United Kingdom. Vet Rec. 1997 Feb 22;140 (8):212. Bassami, M. R., Berryman, D., Wilcox, G. E. & Raidal, S. R., 1998. Psittacine beak and feather disease virus nucleotide sequence analysis and its relationship to porcine circovirus, plant circoviruses, and chicken anaemia virus. Virol 249, 453-459. Bassami, M. R., Ypelaar, J., Berryman, D., Wilcox, G. E. & Raidal, S. R., 2001. Genetic diversity of beak and feather disease virus detected in psittacine species in Australia. Virol 279, 392�400. Cross, G., 1996. Avian viral disease. ln Disease of cage and aviary birds, 3rd Ed. (W. J. Rosskopf and R.W. Woerpel, Eds.). Williams and Wilkins, Baltimore, pp.548-567. de KIoet, E. & de KIoet ,S.R., 2004. Analysis of the beak and feather disease viral genome indicates the existence of several genotypes which have a complex psittacine host specificity. Arch Virol 49,2393-412. Doneley, R. J. T. 2003. Acute Beak and Feather Disease in juvenile African Grey parrots - an uncommon presentation of a common disease. Aust Vet J Vol 81, No 4, April 2003. Environment Australia, 2000. Norfolk Island National Park and Norfolk Island Botanic Garden. Plans of management. Gill, J. H. 2001. Avian skin diseases. Veterinary Clin North Am Exot Anim Pract. 2001 May;4(2):463-92, vi. Heath, L., D. P. Martin, L. Warburton, M. Perrin, W. Horsfield, C. Kinglsey, E. P. Rybicki, and A. L. Williamson. 2004. Evidence of unique genotypes of Beak and Feather disease virus in southern Africa. Journal-of-Virology. 2004; 78(17): 9277-9284. Kiatipattanasakul, W., R. Tantileartcharoen, K. Katayama, K. Susuzki, T. Lekdumrogsak, H. Nakayama, and K. Doi. 2002. Psittacine Beak and Feather Disease in Three Captive Sulphure-Crested Cockatoos (Cacatua galerita) in Thailand. J. Vet Med. Sci. 64(6): 527-529. Kock, N. D. (1990). Confirmation of psittacine beak and feather disease in Lillian�s lovebirds (Agapornis lillianae) in Zimbabwe. Zimbabwe Vet J 21, (2) 73. Latimer, K. S., Rakich, P. M., Steffens, W. L., Kircher, I. M., Ritchie, B. W., Niagro, F. D. & Lukert, P. D., 1991. A novel DNA virus associated with feather inclusions in psittacine beak and feather disease. Vet Pathol 28, 300-304. Phenix, Kerry V. Jonathan H. Weston, Ingrid Ypelaar, Antonio Lavazza, Joan A. Smyth, Daniel Todd, Graham E. Wilcox and Shane R. Raidal, 2001. Nucleotide sequence analysis of a novel circovirus of canaries and its relationship to other members of the genus Circovirus of the family Circoviridae. Journal of General Virology, 82, 2805-2809. Summary: Taxonomy of the species. Rahous, M., and M. H. Wolff. 2003. Psittacine beak and feather disease: A first survey of the distribution of beak and feather disease virus inside the population of captive psittacine birds in Germany. Journal-of-Veterinary-Medicine-Series-B. 2003; 50(8): 368-371. Todd, D. 2004. Avian circovirus diseases: Lessons for the study of PMWS. Veterinary-Microbiology. 2004; 98(2): 169-174. Shane Raidal is a senior lecturer in Veterinary Pathology with a general interest in avian, fish and reptile diseases and particularly viral diseases of these vertebates. His research interests include: The pathogenesis and epidemiology of viral diseases in wild birds in Australia; The pathogenesis and prevention of psittacine beak and feather disease; Circovirus infections in birds; Avian pathology; Fish pathology and exophthalmia syndrome in Western Australian Dhufish.